Blow-drying your hair sounds pretty straightforward. So why is it that our hair looks noticeably different when a hair stylist does it? It turns out there’s some technique to doing what is often a mundane task. To properly blow-dry your tresses, you’ll need the right tools. The higher the wattage on your hair dryer, the more powerful the airflow will be. Hair stylists recommend a dryer with at least 1800 watts to prevent frizz. The thicker your hair is, the higher the watts you should be using. The right brush is also important. Using a round brush will give your locks more volume, whereas a paddle brush will give you a sleeker look. Try to stay away from metal brushes as they heat up really quickly and will overheat your hair. Use a towel to absorb as much water as you can after washing your hair. You should allow your hair to air dry at least 60 per cent of the way through before turning your dryer on. The longer you expose your locks to hot air, the more damage you’re doing to it. Protect your hair. 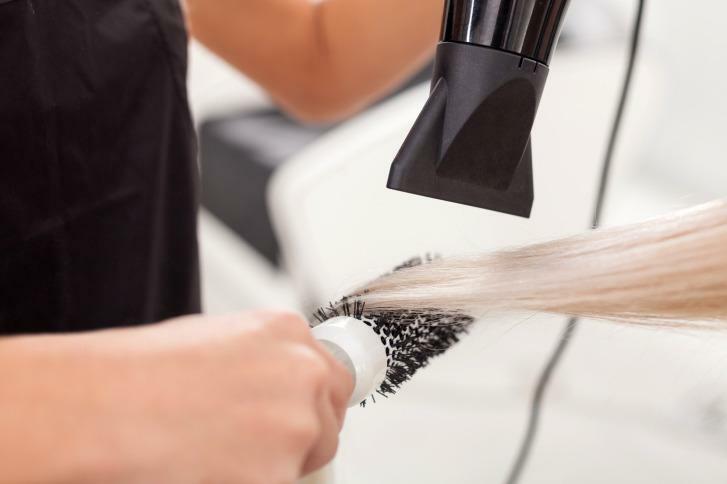 We all know curling irons and straighteners are very damaging to our hair and the heat from a blow dryer can be just as destructive. By using a product with heat protection, you’re helping your mane stay healthy. Separate your tresses into sections. This will allow you to dry each strand thoroughly and prevent frizz, giving you a better end result. Movement is key. The dryer shouldn’t be concentrated on one spot for too long, but constantly moving around the head. This will prevent one spot from overheating. Use the nozzle that comes with your hair dryer. The concentrator directs the airflow to a specific area, giving you more control as you’re styling. If you’re using a high temperature, use a lower speed setting to control flyaways. For some added shine, move the nozzle from your roots to the ends. If you have wavy or curly hair, look for a hair dryer that comes with a diffuser. It’s great for controlling frizz. Control the heat. You may think that more heat will dry your hair faster, but it can actually damage your mane. Stylists say the different heat levels should be adjusted depending on your hair texture. The high heat should be used if you have really thick or coarse hair and the low setting is better for thin and fragile hair. Also. if your hair is damp use the low setting to prevent over drying. If you have a cool shot button, use it. It will set your hair into place and give it more elasticity. So if you, like myself, have been blow-drying your hair incorrectly, give yourself that extra time in the morning and you’ll notice the difference.